Just returned from a fabulous trip to my favorite archipelago, Turks and Caicos—40 islands and cays strung along the blue neck of the Atlantic Ocean like gorgeous shimmering pearls. I stayed on the main island, Providenciales, or “Provo” as locals call it, in Ocean Club West—a peaceful, lushly landscaped resort with individually owned condos renting to vacationers. (I’m going to try to do good deeds the rest of my days so that I can come back in the next life as an Ocean Club owner). As it happens, Provo, which is located about 550 miles southwest of Miami, has the world’s best beach. Don’t take my word for it. Ask anyone who has ever been. Grace Bay beach has to be Mother Nature’s particular favorite sandy playground as she stretched indescribable-soft, dazzling-white, powder-sugar sand over 12 miles and garnished the glory with 350 days of sunshine, gentle trade winds to fan the heat and clear warm water wearing every vibrant shade of blue. No cruise ships dock in Provo (hallelujah), so the beach is uncrowded and as peaceful as a nap. 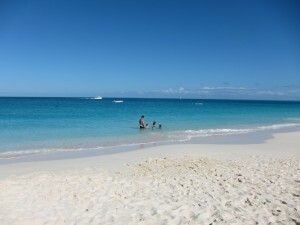 In addition to divine beaches (not only on Provo, but throughout the islands) Turks and Caicos is famous for diving, snorkeling and conch (pronounced “konk”). 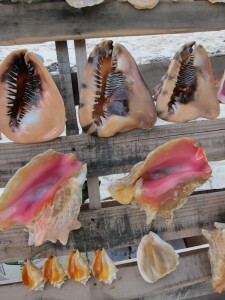 The world’s only conch farm is found on Provo and those wanting to learn about this large marine snail can tour the farm, but savvy tourists learn most in Provo’s restaurants where the almost-totally flavorless, chewy conch is made ever so palatable. Not-to-miss conch dishes on Provo include conch fritters at Ocean Club’s Cabana Bar & Grill, conch ravioli at Coco Bistro, the conch burger at Ocean Club West’s Seaside Café, and all things conch at Da Conch Shack. 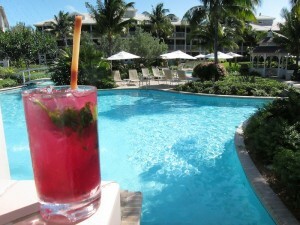 I could give you a recipe for conch, but I have a better souvenir from Provo for you—a recipe for the award winning beet mojito served at Ocean Club Resorts. Yes, you read it right—beet—the veggie, and OMG, of many ways to consume beets, a mojito beats them all. In a tall tumbler or highball glass, muddle 5 lime wedges with mint and sugar until well crushed and juicy. Fill glass with ice. Add rum and beet puree. Stir well. Fill remaining glass with Sprite. Stir gently. Garnish with 1 lime wedge, a sprig of mint and a stick of sugar cane.